Imperialism, nationalism and resistance are the themes that shape my favourite releases and reissues this month. The Birth of a Nation is the most racist film I have ever seen. This 1915 silent black and white film was directed D W Griffith and chronicles the relationship between two families in the American Civil War and Reconstruction era. Most Black characters are played by white actors in blackface and they are portrayed as sexually aggressive towards white women, stupid and lazy. The Ku Klux Klan are the heroes of Griffith’s film, they are seen as the saviours of the nation and the protectors of white women. 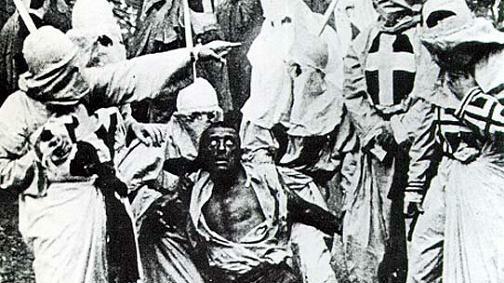 If that wasn’t enough the film is also credited as inspiring the formation of the second era of the Ku Klux Klan. Paul D. Miller’s (a.k.a DJ Spooky that Subliminal Kid) is one of the most original and innovative electronic producers, composer and multimedia artists. He has used his art to support the anti war movement and anti racist struggles in the US. So why has DJ Spooky, used The Birth of a Nation as a backdrop to his music? The answer is he has recontextualised Griffith’s film and placed it in a moral framework, drawing striking parallels between the political conflicts in America during Griffith’s era and today. Rebirth of a Nation was originally commissioned as a live, multimedia performance that premiered at the Lincoln Center Festival in New York (2004). I saw the show at the London IMAX theatre a year later. Rebirth of a Nation is a double album, one CD contains the film score performed by DJ Spooky and the Kronos Quartet.The music is a glorious mixture of Spooky’s trademark dub electronica and epic sounding Aaron Copland landscapes. A remix of a film as deeply important and problematic as The Birth of a Nation reminds us, in the era of Trayvon Martin and Ferguson, that many of these issues still linger with us at every level. I make no apology for recommending for the second month running a reissue of an Ennio Morricone soundtrack. This album is a must have for all Morricone fans. The soundtrack accompanies Gillo Pontecorvo’s film Queimada (Burn!). Pontecorvo only made three films in his life – Kapo, The Battle of Algiers and Queimada. All are classics. Queimada is a film about a slave rebellion and the creation of a fictional republic in the Caribbean. The film stars Marlon Brando who plays a British agent who manipulates a slave revolt to serve the interests of the sugar trade and British Imperialist interests. The leader of the slave revolt is based on the Haitian revolutionary Toussaint Louverture. Morricone wrote and performed music for two of Pontecorvo’s films – The Battle of Algiers and Queimada. Morricone’s soundtrack for The Battle of Algiers is about as perfect as it gets, Queimada’s soundtrack runs it a close second. African drums, Gregorian chants, organ motifs, choral interludes and a nod towards easy listening jazz and pop creates a haunting soundtrack that lives with you long after the album ends. If you can’t get afford the soundtrack or you don’t have a record deck, just buy the film. If you know this label, then the chances are you already have this album. The Cologne based record label Kompact, has released some of the best German dance/electronic music. Formed in 1998 it has showcased the talent of DJ Koze, Michael Mayer, Wolfgang Voit, Vermont and Robag Wruhme. I know it’s a tenuous link to the theme of this month’s favourite tracks but the success of Kompact has played an important part in making Germany a major centre of dance music. The Total series are compilations of some of the labels more ambient and dance orientated artists. This is a track by Weval. This is my curve ball of the month. It’s Nation Time, is thought provoking poetry about the post US civil rights movement. Baraka discusses Black Power and themes of Afrocentricity. But this is not a spoken word album in the conventional sense, there is some real sweet Motown soul, deep heavy Afro-centric jazz, not to mention percussion and vocal interplay. I appreciate its a difficult record to get hold of, but you can listen to it on YouTube. For those who enjoyed the two Amiri Baraka pieces, may I recommend another Album by the poet accompanied by the great David Murray and Steve McCall called ‘New Music~New Poetry, on the ‘India Navigation’ Label. Unfortunately I only have it on vinyl and I’m not sure if it is available in other formats. Track titles include: ‘The Last Revolutionary’, ‘Against Bourgeois art’, ‘Class Struggle In Music’. All beautiful expressions of anger and love.